UPDATED: MAR 10, 2019 Can. Clear golden body, medium white head with average retention and some lacing. Aroma of wet grains, hay, sugar and mineral water with some significant metallic notes. Taste of grains, biscuit, traces of herbs and wet cardboard. Drinkable. UPDATED: JUN 26, 2018 Can from the bodega enjoyed out of a mason jar in my hotel room. Mostly clear dark yellow with a big bubbly white head. Sweet bread malt not a lot of hop presence light tart twang. Not bad. Canned. Clear yellow body with a big whit wheat. The aroma has yeast. The taste has yeast as well. Not good. Jaune pâle avec peu de mousse. L’arôme des céréales et un peu d’houblon floral. En bouche c’est le même. 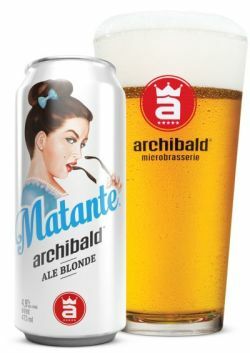 Bière blonde de 4.9 % d’alcool. Elle ne possède aucun col au versement. Elle possède un odorat fin, simple. Son goût est légèrement âcre, comme un goût de betterave. Elle possède une légère amertume en finale et restant en bouche. Correcte ! Can. Lightly hazy gold pour with thin white head. Aroma is grainy, lots of flour, bready notes, dull hops. Taste is grainy, really floury doughy flavors. Palate is light bodied, slightly watery. Meh. Pale blond color. Dry, clean, but there is no notable aroma or flavor. Anonymous. More Lager than Ale. On tap @ Archibald (Montreal airport). Clear golden with a lot of small bubbles and a small white head. Aroma is boring with grains and light honeyed malt. Taste isn’t much better... grains, honeyed malt and light citrusy notes. Light body. Watery. Lively carbonation. Bland finish. It’s hard to make a beer more boring than that.